In 1998, I had the opportunity to travel to Taizé, France on a study tour with Estelle McCarthy and fellow alumnae from Presbyterian School of Christian Education (PSCE). It was a life-changing, soul-deepening journey. I selected a poster of one of the stained-glass windows from the sanctuary at Taizé as a souvenir and remembrance of my trip and the week of prayer, song and contemplation. During Advent, I am repeatedly drawn to Luke’s account of the angel Gabriel’s annunciation to Mary. The unexpected arrival. The unexpected message. The unexpected future that is to unfold before her. Rarely are we visited today by angels whom we can see and touch. We may recount ways we feel surrounded by God’s angels, bearing us up. We may acknowledge God’s presence in the protection of angels. Yet, to see an angel standing before us is rare. Of course, Mary would be perplexed. Afraid. The Lord is with her. I am struck by the artist’s interpretation of Mary’s stature as the angel greets her with life-changing and world-changing news. Mary is shown head bowed, hand over her heart, humble. Yet, this is no reclining, bed-bound Mary. Instead of kneeling, she stands as she receives the angel’s message, secure in her capacity to receive God’s messenger. We often see images of Mary clothed in blue. Serene, gentle. In the early church, blue was associated with royalty. In this rendering, she wears red and gold, colors of love, passion and pain coupled with importance. These colors belie the threads of Mary’s life, an interwoven mix of love for her son, the passion of parenthood and the pain she will know as she watches Jesus emerge, fall and die. “How can this be?” she asks. The one to come through her is the Messiah awaited by her people. A child of the house of David. Wait . . . it is a child to come? A baby? This is the One who will reign, who will save us? The Lord is with her. Nothing will be impossible with God. At this assurance, Mary gives quick response: “Here am I, the servant of the Lord; let it be with me according to your word.” I am struck with her willing ascent. Would I have consented as quickly? Would the angel’s words of assurance and favor be enough to convince me to step into the uncertainty and upheaval that Mary is accepting here? 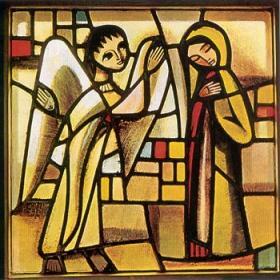 Mary’s life-changing moment is captured in this stained-glass scene. And the world is changed forever. Excellent perspective Beth. Much food for thought during this very special time of year. Thank you for challenging us! Hope you have a very joy-filled Christmas that will linger throughout 2019.